This presentation is perhaps the biggest “wow” for me at the conference because it showed a cool way to involve the audience in your presentation. Ben Foxall showed what he could do with browsers doing a very cool live demo of all the device APIs using audience's devices. Browsers do more than just presenting content; they allow us to gather information about our surroundings and make changes to our environment. Taking inspiration from the Internet of Things, we’ll think about our browsers as simple objects that can work together to create a closer interaction with the web. Animation has become an increasingly important part of the UX design experience across many web applications. Moving elements are a powerful tool to attract users’ attention. Courtney Hemphill talked about the basic principles of animation design and the simple formulas that can be used to create robust animations. With a quick introduction into interpolation, easing and sequencing Courtney showed how to create a lot of effects with just a little code. ES6 (ECMAScript 6, also known as ECMAScript 2015) is the latest version of the ECMAScript standard. ES6 is a significant update to the language, and the first update to the language since ES5 was standardized in 2009. Matt Keas showed some awesome new features in ES6 and talked about canvas drawings, simulations, animation techniques. The Ember community took on an audacious effort to rewrite the rendering engine powering Ember apps. Tom Dale shared details on this new engine, called Glimmer, which dramatically improved the performance of real-world apps in modern browsers. Tom walked through the libraries that power Glimmer, giving insight into how a sophisticated framework like Ember works under the hood. Steven Wittens is known for his amazing animation effects, using texture uploads that are really fast and efficient. Stevin went into great detail how each pixel is a virtual machine on its own, with math inside pushing the 3D boundaries in a WebKit browser. Unfortunately for everyone, there’s a huge attack surface on the client-side, and it can sometimes feel like a hopeless goal to ever patch up all the holes. Alex Sexton went through a bunch of ways that you might not expect hackers will attack your site. Hacking methods like CSRF, Frame Busting, Content injection, Link knocking. Alex showed what we can do about it, like CSP, SRI, HTTPS only and submit your domain to the HSTS list. Also looking into exciting new standard APIs out of the W3C to help address these problems. What do you think? Were you there? 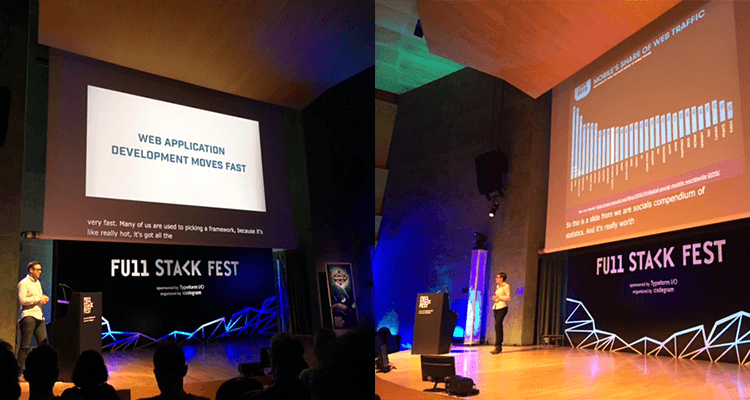 What were your biggest takeaways from Full Stack Fest? Do you love building product-quality, lightning-fast and responsive web user interfaces with latest web technologies? Then be part of our team!